Sophomore efforts following a successful debut tend to go one of two ways – either a bigger, louder and more ambitious record or more of the same, invariably with lesser results as it lacks the surprise of their debut. The lead track on 'Young And Old' is called 'It All Feels The Same', which would suggest the latter but this is misleading as the band have attempted to progress. However, there are clear limits to how much bolder a band as precious as Tennis can be. Recorded in only three weeks, the record has a cleaner production than the debut courtesy of The Black Keys’ Patrick Carney and has a fuller band sound, adding more muscle to their songs of love. Unfortunately, this serves to work against the band, highlighting the lack of dynamism which may have been previously obscured by the fuzziness of their earlier recordings. 'Young And Old' is very much a record of two halves, with the first half the far stronger and having more variety. The aforementioned opening track and lead single 'Origins' see the band realising their aim of sounding like "Stevie Nicks going through a Motown phase". Indeed, there are nods to Motown throughout, whether it’s Alaina Moore’s voice or the organ sounds which litter the record, reminiscent of 60s soul. Best of all is 'My Better Self' which sees the band experimenting with synth-pop and pulling it off with great success. Regrettably, the quality of the record dips substantially after 'Petition', with 'Robin' and 'Take Me To Heaven' twee pop by numbers. The only high spot on the second half is 'High Road' which finds Tennis rocking harder than ever with its propulsive rhythm and crackling snares. 'Young And Old' is a pleasant listen, nothing more, nothing less. While debut album 'Cape Dory' had a carefree naivety about it, this record is more calculated and consequently less charming. It may leave a smile on your face but it will be short-lived as the songs fail to linger long in the memory. 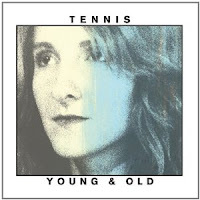 A disappointment but the Tennis’s knack for catchy melodies means it would be foolish to already dismiss them. 'Young And Old' is available to purchase at Amazon.co.uk.